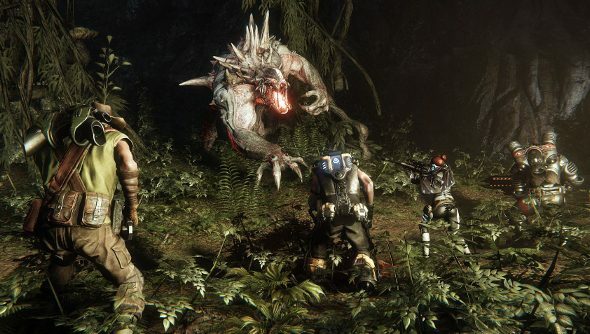 Turtle Rock and their publisher friends at 2K have today announced that the Evolve alpha will indeed be coming to PC on October 31st, one day after launching exclusively on Xbox One. Access to the remarkably fun, four-versus-one monster hunting co-op shooter will available for anybody who pre-orders the game, and concludes on November 2nd. That’s a full weekend of tracking and snaring and hiding and seeking. Hooray for the slow erosion of anti-consumer notions of platform exclusivity! Boo for the forgotten concept of alpha and beta releases being anything other than marketing tools! Woo! Ahhh! Gahhh. We’ve no idea where that code came from, but at the time of writing it works. And isn’t that really all that matters?